The Catholic Jedi Academy: Launch The Missals! This Is Not A Drill! There's an intriguing March 25, 2011 article from Zenit on Missals (see text and links below). 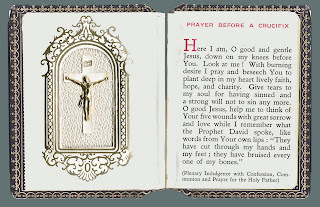 Our good friends over at New Advent Catholic Encyclopedia tell us that a Missal (Latin Missale from Missa, Mass), is a book which contains the prayers said by the priest at the altar, and the readings and hymns sung in connection with the offering of the holy Sacrifice of the Mass throughout the ecclesiastical year. 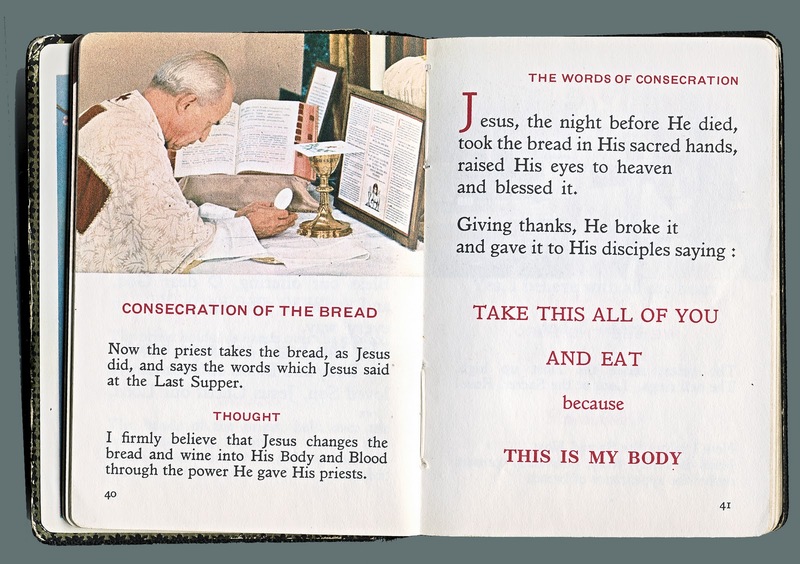 As a child growing up in the early 1960s in Brooklyn, New York, every Catholic girl and boy receiving their First Holy Communion received two spiritual weapons to support and expand their Catholic Faith: A Rosary and a Missal For Children. I carried my Missal with me to every Mass I attended until I knew every prayer by heart and didn't need it anymore. 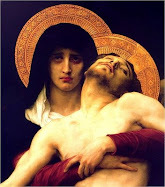 I know that I learned the prayers and the meanings of the various parts of the Mass because of that Missal -- with it's beautiful photos, artwork, stately binding, and "Thoughts" (mini-prayers/teachings). 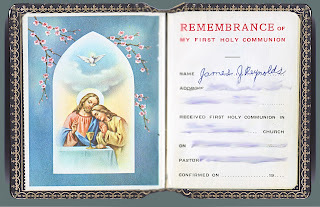 I still have my First Communion Missal. (The Rosary didn't fare as well, unfortunately.) 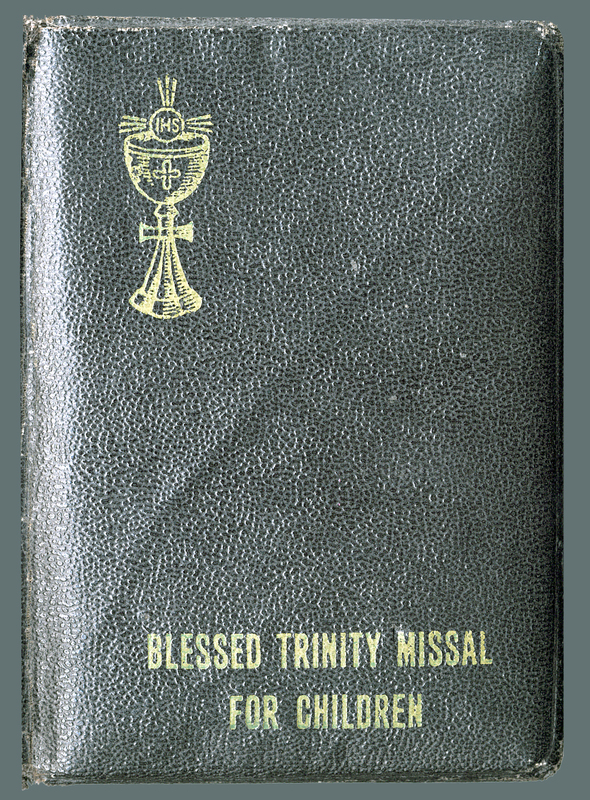 My copy of The Blessed Trinity Missal For Children is over fifty-years-old - originally printed in 1962! It's still in good condition! They made `em to last back then! I wrote my name in my best 2nd Grade Cursive handwriting! I have had several "debates" over the use of Missals with priests, actual Liturgists, and self-proclaimed experts on Liturgy. Notice: An actual tiny Crucifix embedded in the inside cover! Many of these "experts" denounce the use of Missals by the people attending holy Mass. The usual rationale goes along the lines of, "People should be paying strict attention to what is happening at the Altar;" (I often wonder if that really means "to who is [i.e., me] at the Altar") "They shouldn't be reading along, but fully participating -- looking and listening to what is happening at the Altar!" (Huh? Devoutly following along isn't participating?) "Missals should be gathered up in every church and thrown away!" He gave His priests." Great catechesis for 7- to 10-year-olds! As a priest, I haven't had much patience for pseudo-liturgists' ultimatums. I find these rants egocentric, unrealistic and often disrespectful and insulting to the people praying in the pews. I have no problem at all with the use of Missals during Mass. Frankly, there are people attending Mass who are deaf and use a Missal as part of their devotion. Others may struggle with some form of attention deficit problem and use a Missal to deeply concentrate on the prayers and readings. As well, in a multilingual, multicultural inner-city Diocese, there are people who do not speak or read English. They use a Missal in their native language to pray from their hearts. 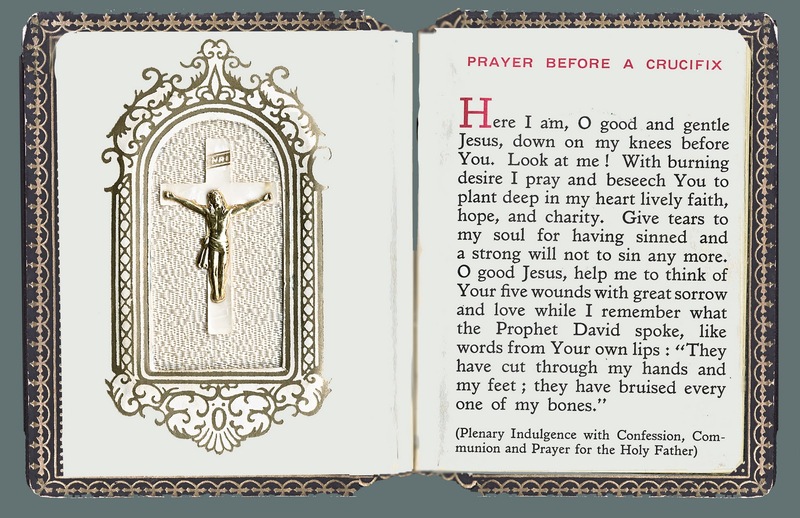 My childrens' Missal made a profound difference in my faith and devotion. I'll bet there are thousands of Catholics who can claim the same blessings from such a small book. I predict -- and Father Paul Gunter, OSB, who wrote the Zenit article, seems to predict as well -- that Missals will have a strong comeback with the introduction of new prayers and readings at Mass because of the new English translation of the texts from the third edition of the Roman Missal (which uses Latin as the official language of the Church). And I think that Missals will achieve what they were created to do when they first appeared in the late Meddle Ages: They will teach and nourish the Faith of the people in the pews, who will spread the Faith to their families, friends, neighbors and strangers! Benedictine Father Paul Gunter is a professor of the Pontifical Institute of Liturgy Rome and Consulter to the Office of the Liturgical Celebrations of the Supreme Pontiff. ROME, MARCH 25, 2011 (Zenit.org). The use of missals by the laity, at least on mainland Europe, extends for considerably more than two centuries, providing access to the riches of the liturgy for lay people increasingly interested in the liturgical action unfolding before them. In countries where religious persecution was a reality, such as in Great Britain during penal times, the possession of such a book would have provided opponents of the Catholic faith with adequate evidence of adherence to "popery." It was not, in the British context, unknown in recusancy, for the texts of certain Masses as well as the ordinary of the Mass to be printed within a broader devotional manual aimed at a catechesis of the faithful. In Italy, the influence of the Synod of Pistoia in 1786, three years prior to the French Revolution, had its effects on the Italian liturgical movement (1672-1750) begun by L.A. Muratori, which stressed the need for increased access to the texts as intrinsic to any process of liturgical reform. Between 1788 and 1792 there appeared translations into Italian of the Mass both in the Ambrosian and Roman rites with explanations given about principal feasts, which were contained within a guide to prayer for pious faithful. Similar happenings were found in France and Germany that mushroomed when inspired by the liturgical initiatives of Dom Prosper Guéranger during the 19th century. The use of missals fostered a manifestly liturgical association with the liturgy which incorporated the literate into the intricacies of the liturgy celebrated in Latin and schooled them in liturgical prayer. Missals often included the texts of vespers for Sundays, which became a feature of many parishes especially in France, the Netherlands and Germany. During the 20th century, missals increasingly contained with catechetical material about the liturgical year, commentaries on sacred Scripture and about eucological texts. Responding to the Liturgical Movement heralded by Pope St Pius X, the Cabrol Missal and the Missal of St André were in the forefront. 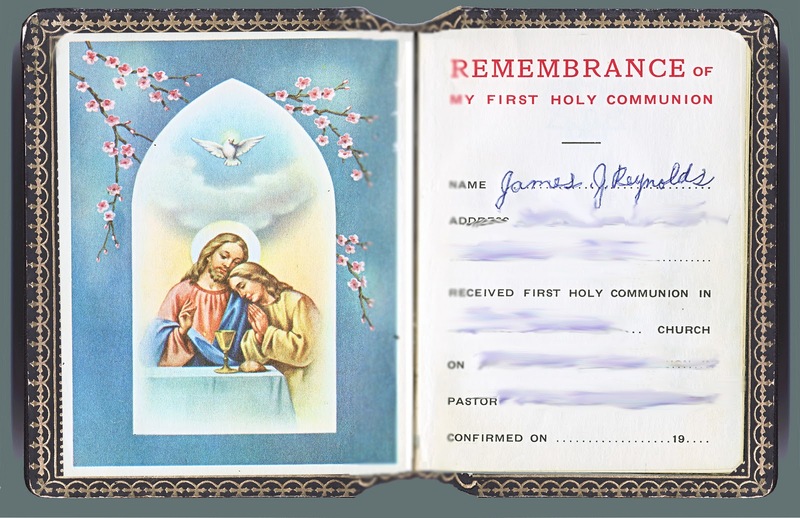 In our present day, at celebrations of the extraordinary form, missals are a considered pre-requisite, not only as a means of participating in texts which are often intentionally silent, but, more crucially, as a means of following the texts of Scripture as well as those of particular rites attached to certain days which would not be familiar. They contain an abridged version of the rubrics when compared to those contained in the altar missal. They also provide a collection of texts and illustrations of sacred art found conducive to prayer and meditation and which help to detract from inevitable distractions. Since missals could be as artistically beautiful as expensive, the faithful make sacrifices to possess one. 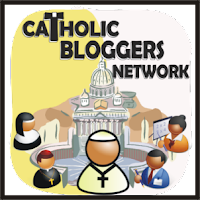 Correspondingly, they have developed with time into a symbol of Catholic identity and pride. In the context of the ordinary form, the purpose of a missal for participating at Mass is less clear. Though many people choose to possess one, maybe culturally inspired by the previous example, and who bring it diligently to Mass each week, the hermeneutic of participation has changed. This change has affected people to the extent that many have simply stopped using them. However, a missal remains a huge support to those who are deaf or hard of hearing and in situations where the proclamation of texts is, in practice, barely audible. Speaking at cross-purposes about what is meant by a missal in the ordinary form is a risk. 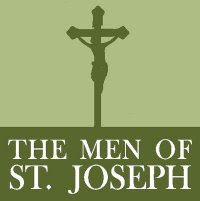 For laypeople, it is the book they use if they desire to follow the texts at Mass. In an updated style, a missal contains all that is needed in one volume, together with whatever liturgical and scriptural commentaries the edition decides to include. For the clergy, the missal is to be distinguished from the lectionary since the missal does not contain the scriptural readings proclaimed at Mass. The majority of Catholics have grasped, if only from what they have witnessed in recent generations, that the Liturgical Movement of the 20th century strove to reform the liturgy. Few have necessarily appreciated that, when "Sacrosanctum Concilium" called for the reform of the liturgy, it did so by calling for its reform in partnership with its promotion ("Sacrosanctum Concilium," No. 1). Far from being diminished in importance, the liturgical life of the Church was to grow in prominence. In order for it to do so, it was necessary that the liturgy communicate effectively what it celebrates so that the minds and hearts of those who celebrate it would be able to articulate themselves what was being promoted. That hermeneutic underpinned the direction of "Sacrosanctum Concilium": "Pastors of souls must therefore realize that when the liturgy is celebrated, something more is required than the mere observation of the laws governing valid and licit celebration; it is their duty also to ensure that the faithful take part fully aware of what they are doing, actively engaged in the rite and enriched by its fruits" (No. 11). 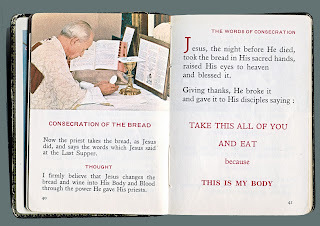 Steadily, since Vatican II, missals have been depended on less in the promotion of liturgical life within the celebration as people have learned their responses and to make them together "as befits a community" ("Sacrosanctum Concilium," No. 21). The readings are read aloud with the assistance of a sound system and from an ambo that faces the assembly. Many of those who once followed texts in missals became lectors, thus discovering a new and sincere piety as they found themselves exercising a genuine liturgical function. Clergy, encouraged by "Sacrosanctum Concilium," based their preaching on the readings of the day, with the result that sermons gave way to homilies rooted in liturgical preaching. Consequently, as they grew familiar with the rites, people needed, less and less, to read accompanying material to give them structural indications. They would, in greater numbers, subsequently, set aside their missals. Also, for the first name in centuries, they would begin to use the word "homily" as "homilists" spoke throughout the liturgical year, now moved by "Sacrosanctum Concilium" Nos. 51 and 52, whose opening phrases are "The treasures of the Bible" and "By means of the homily." Clergy were further reinforced by the centrality of a liturgical communication of Scripture by "Dei Verbum": "Clergy must hold fast to sacred Scriptures through diligent sacred reading and careful study […] so that none of them will become 'an empty preacher of the Word of God outwardly who is not a listener to it inwardly'" (No. 25). Ironically, the use of missals and of missalettes are about to make a comeback as parishes grapple with the new translations of the third edition of the Roman Missal. It remains to be seen if the renewed publication of missals for the ordinary form in the light of forthcoming new translations will augur a new interest in their communal use in the liturgy in the long term. What is certain is that these publications need to be imbued with the spirit of the liturgy and encourage conformity to what the Church is asking of us in this renewed opportunity for an authentic catechesis on the Mass gleaned from insights of the new translations. In order that the faithful should be led anew to a genuinely "fully conscious and active participation in liturgical celebrations" ("Sacrosanctum Concilium," 14), those entrusted with the implementation of the new missal will need a refresher on "how to observe the liturgical laws’ ("Sacrosanctum Concilium," 17). Then, missals and other supplementary material will bring forth the beacon of unity that is a celebrated liturgy, faithfully reformed and promoted, so that it is "taught under its theological, historical, spiritual, pastoral and juridical aspects" ("Sacrosanctum Concilium," No. 16). Choose A Patron Saint for 2012! "Father, Pray For Me, I Will Not Survive"
Whitman's Chocolates Heard The Christmas Bells!